WICI Song and Dance Company is registered in the state of Illinois as a non-profit organization, and is the representative group of the Polish National Alliance. It is not a school of dance and does not offer dance classes. 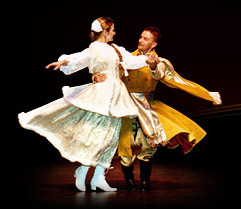 Rather, it is an artistic ensemble specializing in the performance of Polish folk songs, dances and music. As such, the group is available for hire at public events, and frequently collaborates with other artists to provide entertaining artistic programs in a variety of venues. WICI is distinct from other folk groups in the Chicagoland area as a result of its high caliber of artistic achievement, and the unique successes of its Artistic Director, Ms. Magdalena Solarz. All performances are prepared with the highest standards of artistic excellence in mind. Therefore, each dancer in WICI is assigned a position that best reflects his/her talents and abilities. Each assigned position is equally important, since a performance is not made up of solos, but rather is a group effort. There is no sign-up fee for membership in WICI. However, each dancer must purchase an insurance policy through the Polish National Alliance, or transfer an existing PNA policy to a WICI Lodge. Insurance policies, once purchased, must be kept up-to-date for the duration of membership in WICI. TIMELY attendance at two rehearsals per week is required. Additional rehearsals may be scheduled prior to important performances. All absences must be reported in advance to the Artistic Director, Ms. Magdalena Solarz. A dancer who is scheduled to perform may not be absent from a performance – this is cause for immediate removal from the group. Rehearsals last only two hours, and must be taken advantage of to the fullest extent possible. Dancers must demonstrate a level of respect and concentration during all rehearsals, especially to the Artistic Director and all guest choreographers, but also to their fellow dancers. Private conversations should be reserved for rest periods, and should not take place during the rehearsal. While not on stage, dancers have a responsibility to maintain a dignified and respectful demeanor – your actions reflect on the group, and contribute to our reputation! • All jewelry (earrings, watches, rings) must be removed during rehearsals for safety reasons. • Gym shoes and/or baggy cargo shorts are inappropriate rehearsal attire, and are not allowed! It is each dancer’s responsibility to use deodorants and/or antiperspirants strong enough to withstand athletic activity. Hair is to be neatly combed and securely tied. Each dancer must arrive on site one hour prior to the performance time in order to adequately prepare for the show. All jewelry (earrings, watches, rings) must be removed during performances for safety reasons, and also because they are not an authentic part of Polish costume. Instruction is provided in advance by the Artistic Director as to proper hair styling and costume for each scheduled dance. Each dancer will have costumes assigned by the Costume Director. As a result, dancers are not allowed to take or exchange their costumes with other dancers. Each dancer is responsible for the care of his/her costumes. Any simple repairs (sewing on a button, etc.) are the responsibility of each dancer. Larger alterations (hemming, etc.) must be reported to the Costume Director, and will be made by a seamstress if appropriate. Costumes and all accessories are the sole property of “WICI,” and may not be kept in a dancer’s home or any other personal location. Each dancer is asked to volunteer with the transport of costumes to and from the performance site on a regular basis. If you transport costumes to a performance, you must also take them back afterwards, or arrange for someone else to undertake this responsibility for you. All dancers are responsible for the packing of costumes following each performance. It is only after all costumes are accounted for and packed that dancers may leave the performance. Car pooling to performances is encouraged. Dancers who drive their own car to and from performances may request reimbursement for parking and/or fuel expenses, when such reimbursement has been announced and authorized in advance by the Artistic Director. Original receipts for parking and/or fuel should be mailed to the Administrative Director within one month of the performance, to the official WICI business address.